Chef Gerard Craft’s lasagna is a bit of a project, but the result is over-the-top delicious. The best lasagna, says chef Gerard Craft, doesn’t have tomato sauce or meat. 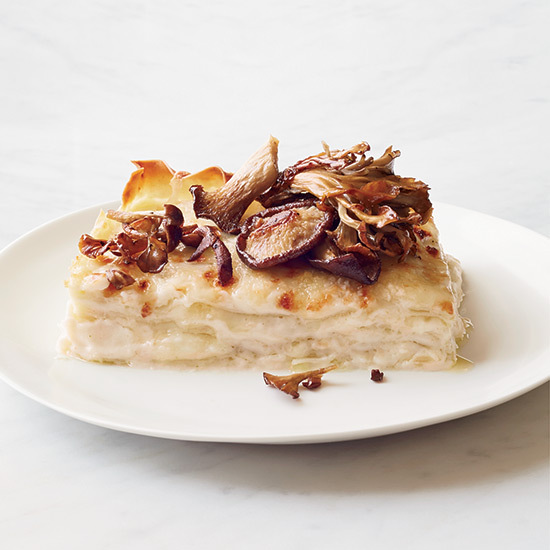 The most perfect lasagna, he says, the one for true pasta lovers, is a creamy white version, a lush layering of just three elements: delicate homemade egg pasta, béchamel, and melted Grana Padano and Fontina cheeses. He first tasted the dish in Umbria eight years ago. “That white lasagna, in its total simplicity, will always be the ultimate rustic Italian dish to me,” he says. Craft briefly put it on the menu at his St. Louis restaurant Niche, and four years after he took it off, customers are still asking for it. Craft sends them over to his other restaurant, Pastaria, where he serves slices with toppings like a tangy salsa verde, a carrot puree or his favorite, roasted wild mushrooms. It’s like a lasagna version of bruschetta. Craft’s lasagna is both simple and indulgent: It’s rich, cold-weather food. Here, he shares his recipe and three great ways to top it.